Former Prime Minister of the United Kingdom Winston Churchill is credited for rallying the British people during World War II and led his country from the brink of defeat to victory. Widely regarded as one of the greatest wartime leaders of the 20th century, Churchill was also an officer in the British Army, a historian, a writer, and an artist. He won the Nobel Prize in Literature and was the first person to be made an honorary citizen of the United States. Offered is a rare signature from Churchill on a first day cover. 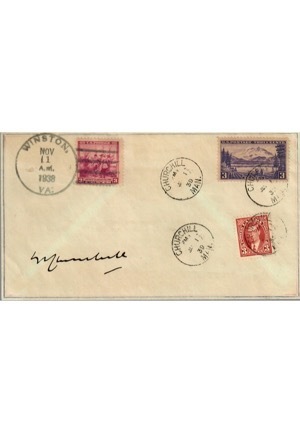 The first day cover envelope contains five postmarked stamps dated throughout the 1930s and three “3 cent” postage stamps, two from the United States and one from Canada. 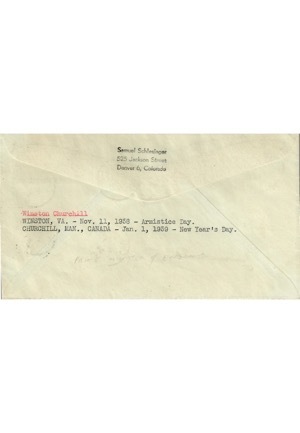 Churchill signed the bottom in bold black ink and in our opinion the signature rates a 9. Accompanied by a LOA from JSA.